(CONTEST CLOSED) Win a JUSTICE LEAGUE HeroClix 24-Pack Box! 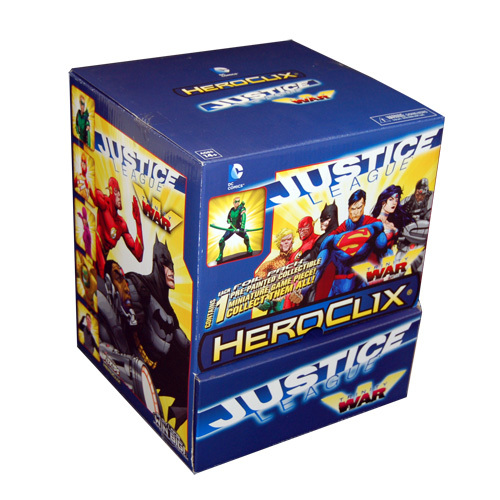 Home » ACTION FIGURES & MERCH » (CONTEST CLOSED) Win a JUSTICE LEAGUE HeroClix 24-Pack Box! (UPDATED: CONTEST CLOSED) We team up with the HeroClix folks to give you a chance to win a 24-pack gravity feed box of the new Justice League: Trinity War series! There’s all sorts of hot DC Comics news right now: What better time for a Justice League contest? Here’s your chance to win one 24-pack box of Justice League: Trinity War HeroClix from the people at NECA/WizKids! Step 1: Answer this question: In what 1960-dated comic book did the Justice League of America debut? Step 2: Email the answer to The13thD@gmail.com. You must include the comic-book title and issue number! Step 3: One winner will be selected at random from those who send in a correct answer. To expedite shipping, include the name of your city and state in your entry. Step 4: The winner will be announced on Twitter, so follow us @13th_Dimension – because the winner could be you! The Fine Print: One entry per person. Prize will only be shipped to a continental U.S. address and will be sent within about 30 days of contest’s end. Judges’ decision final. Entries must be received by 11:00 p.m. ET on Sunday, Feb. 15.